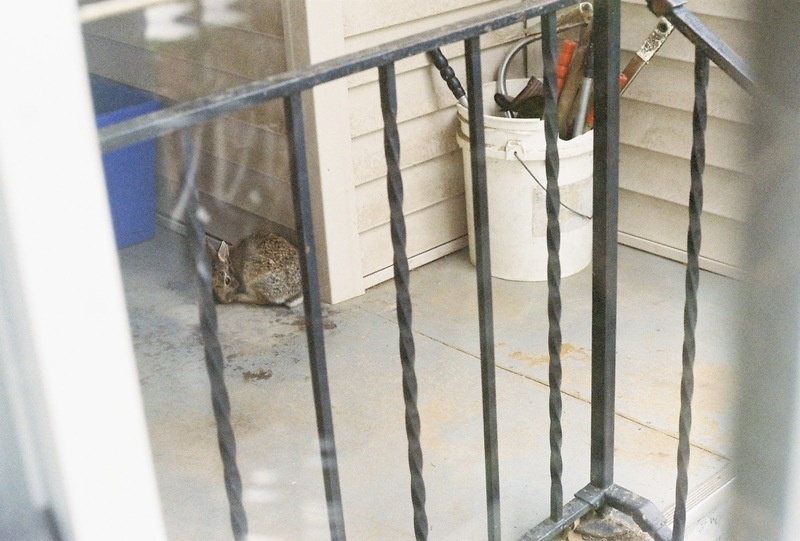 Is this rabbit looking for someplace to eat or someplace to hide? 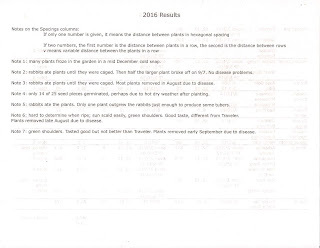 When you do garden research, consider posting your results to the Internet, as I’ve done here. This will help gardeners in your own region know what varieties work well, how to grow them, and how much to expect to harvest. Midwestern gardeners learn early on that our changeable (read: weird) weather is a garden force to be reckoned with. Assuming I do everything correctly on my end – and for “assume”, you know what to read – the weather becomes the major determiner of what the garden produces. And a good indication that I didn’t do everything correctly is unusual results given the weather during the growing season. So let’s first look at 2016’s weather and make predictions based on it. The biggest weather challenges of 2016 were the excess heat, especially in autumn, and heavy rains in July and August. While the growing season was only a little longer than normal (the last spring frost was on April 9 and the first fall frost was a week or two later than usual, occurring on November 13, for a 218 day growing season), it was distinguished by its warmth. The St. Louis NWS site says that 2156 cooling degree days accumulated in 2016 (all but 8 of these during the growing season), a total of 516 more than normal, and more than any year in the last two decades or so except for 2012. More importantly for the garden, the heat was accompanied by high rainfall during July and August. A combination of high heat and humidity in July and August often causes tomatoes and peppers to succumb early from disease. The only two drier than normal periods were in mid April and in June. September and October were both much warmer than normal, a situation that usually reduces yields of the fall greens and roots, which need cooler conditions to do their best. Looking at weather and nothing else, I would have expected good to excellent yields for most spring and summer crops (excepting peppers and tomatoes) but somewhat lower yields of fall crops compared to past years. As I noted in this post, I made some changes to the garden in 2016. The most far-reaching changes were the removal of fencing around two of the three sets of vegetable beds and follow-on effects to obtaining a chipper/shredder. Other changes will be mentioned in the vignettes on individual crops. 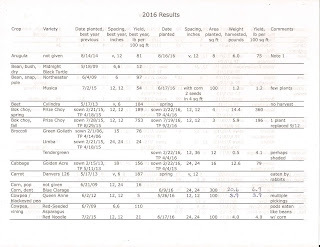 The four figures at the bottom of this post show the results I obtained for most of the crops that I grew in 2016 in comparison to the best yield I have obtained in the past for that crop. 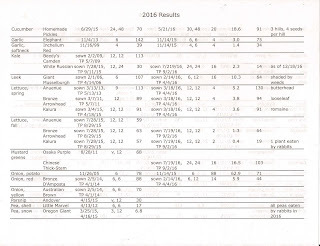 The five leftmost columns give the particulars for the year in which I obtained the best yield, while the six rightmost columns give the information for 2016. Look at the Comments column on the first three figures and the Notes on figure 4 and you’ll quickly see what I meant by the title of this post. While removing the fencing around two of the three sets of beds did make it much easier to work in the garden, it also allowed rabbits access to crops that in their opinion I had planted for their benefit. I didn’t have to guess that rabbits were responsible, either. I caught the floppy-eared rascals in the act of eating. It so happened that Mike and I made an addition to our garden tool inventory early in the year that contributed to the rabbit raids. Because I planted a lot of trees and shrubs on our property, and trees and shrubs need pruning, and the prunings pile up, and the pile of prunings represents a resource not being used, we purchased a used wood chipper/shredder. We held one shredding session in February, producing a gratifying amount of wood chips from a large pile of prunings. But I don’t enjoy using powered machinery, and the chipper/shredder is worse than most in the amount of noise that issues from it and its potential for mayhem. So after that one big shredding session, I started another pile of prunings, telling myself we’d wait till I finished pruning before we operated the chipper/shredder again. Well, by the time pruning was done, it was time to prepare beds and plant. And prepare and plant more beds. And weed. And plant. And harvest. And so on … and I kept adding branches to the pile from summer storms and from shrubs we removed to make room for a back porch addition. And the growing pile was only about 6 feet (2 meters) or so away from the garden. The pile of prunings on an icy winter day. Just beyond is the garden. The blue tarp is smothering grass where new garden beds will be dug in 2017. 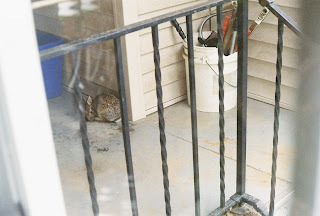 Now if I’d read the third revised version of The Wild Mammals of Missouri last spring (alas, it wasn’t yet available), I would have realized that I was creating a four star rabbit resort. Rabbits enjoy living under thick brush piles because most of their many predators cannot get to them there. Couple the secure rabbit residence with a bountiful buffet (aka vegetable garden) just a few steps away, and the rabbits not only made themselves at home but also invited all their relatives and friends to join them for extended stays. Many times I watched rabbits I flushed out of the garden dart into the pile of prunings and thought longingly of rabbit stew. I’m of German ancestry and grew up on the German version, hasenpfeffer; it’s one of my favorite foods. But it wasn’t hunting season – except for the rabbits, who were happily engaged in hunting down and eating all the produce they could stuff into their bellies. After the rabbits taught me what I’d done, I pondered how to respond. I could have re-fenced the beds. But by that time I knew I’d be changing the configuration of the beds for 2017. Any fencing I put up would have to be removed and replaced before the next growing season, something I preferred to avoid. I’d also grown to like not stepping over a 30 inch (0.8 meter) tall fence to get into the garden, and being able to bring a lawnmower and a garden cart right up to the garden beds. So I tried using repellent around the spring greens and roots and around the peas, to make those areas smell like predators instead of food, and caging the peppers, eggplants, and sweet potatoes with the same cylinders of hardware cloth that I place around saplings to protect them from rabbits. While my attempt to protect the spring lettuce crop succeeded, it was too little, too late for the beets, carrots, and peas. I was able to protect the new sweet potato plants while they took root, but as soon as the vines started crawling out of the cylinder, the rabbits ate them. And although the peppers and eggplants eventually recovered from their rabbit pruning, the lost growth time, coupled with disease-inducing heat and humidity that killed the pepper plants early, reduced the pepper yield drastically, while some critter, I don’t know what, ate each of the few eggplants that formed a day before I deemed they were ready to harvest. Score it Rabbits 1, Gardener 0 for 2016 for these crops. As you’ll see from the figures, not all of the crops were eaten by rabbits. I’m not sure if they don’t like those crops or if they took pity on the poor incompetent human and left them alone in an act of rabbit charity. 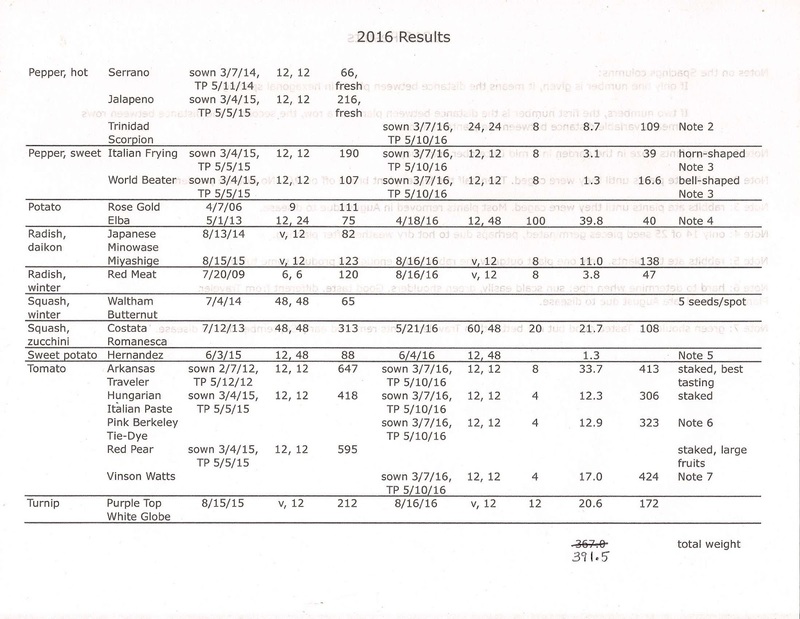 At any rate, you can find the overall weight of vegetables, beans, and grains that I harvested in 2016 on the third figure near the bottom right. It amounts to about 57% of 2015’s yield. If you think I’m disappointed by that, you have another think coming, as my mother would say. 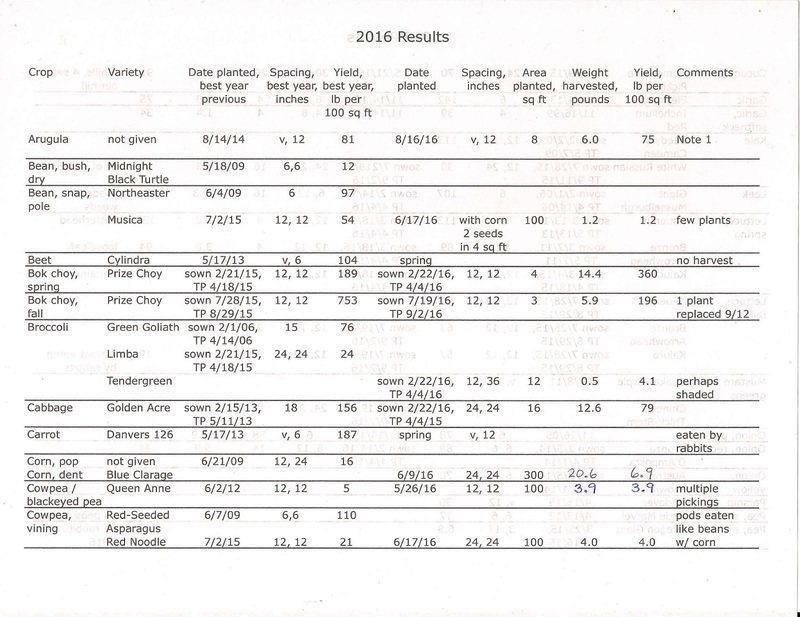 In fact, except for the crops that the rabbits ate, the yields we got matched better with how much we wanted to eat and how much we were able to preserve for later than did the 2015 yields. Nevertheless, I think there is room for improvement, especially now that we have obtained a small chest freezer that allows us to freeze more of what we cannot eat. And now, here’s what I learned from the rest of the crops that I grew. Onions: after another disappointing year for red onions contrasted with harvesting more than enough potato onions to last us until the next harvest, I have decided to stop trying to start, plant, and grow red onion seeds in sub fluffy optimal conditions. Potato onions rule! Garlic: I have concluded that rocambole garlic and the Midwest are not meant for each other after yet another disappointing year (data not shown in the figure). I’m sticking to ‘Inchelium Red’ and elephant garlic from now on. Bok choy: four plants are plenty for the two of us at the yields I’m now able to obtain. And don’t try to tell me that bok choy can’t be grown successfully in the spring; check out the yield of spring-planted bok choy for proof that it can be. Broccoli: hybrid vigor is supposed to lead to improved yields for cross-pollinating crops like broccoli, but 2016’s hybrid broccoli variety ‘Tendergreen’ seems not to have gotten the memo. However, planting issues (too much shading from nearby crops) may have been a factor. 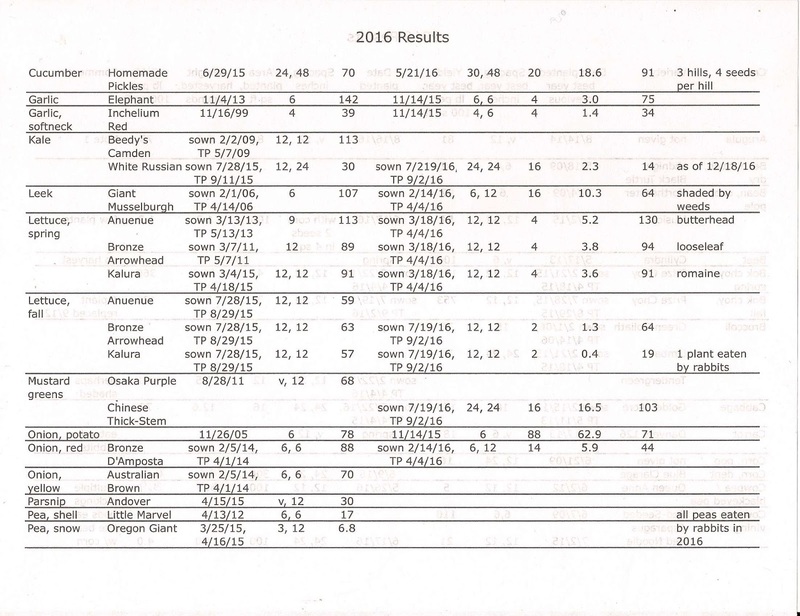 Fall-planted cabbage family crops, leaves and roots: as I predicted, yields of all of these, except mustard greens and daikon radish, were lower in 2016 than the best past year. 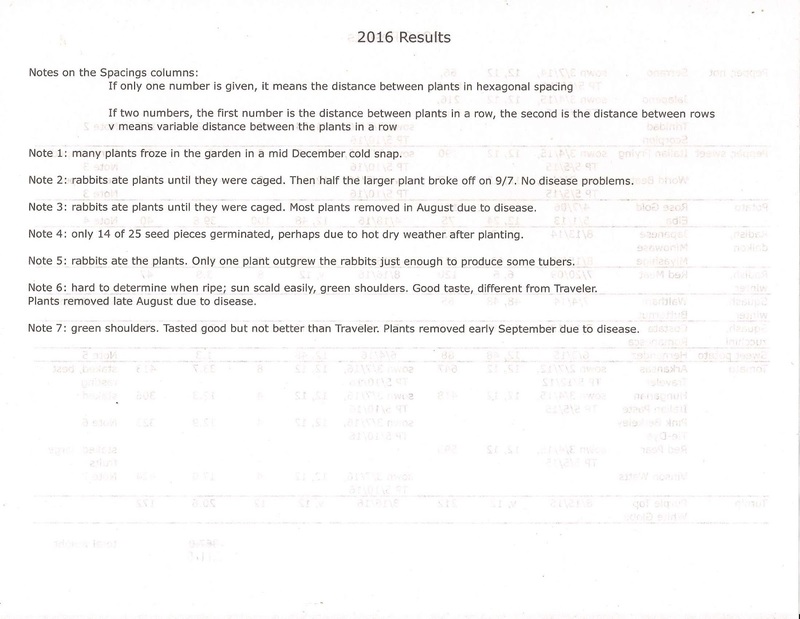 For kale, another factor besides the heat was larger spacing between plants in 2016 compared to 2015. Lettuce: once I protected the spring lettuce, it rewarded me with excellent growth. May’s warm, wet weather gets most of the credit for this. But the rabbits got back at me in fall. They did seem to turn their noses up at ‘Bronze Arrowhead’ lettuce in favor of the other varieties, something those of you who garden with rabbits might find noteworthy. The humans in this house, on the other hand, like ‘Bronze Arrowhead’ just fine. Cucumbers: I grew them on a trellis, which made them easier to find and harvest. We’re still eating some pickles that Mike made from them. Butternut squash: the rabbits left these alone – but I wouldn’t want to bite through a prickly squash stem, either. If I hadn’t let the area in which the squash were growing go to weeds so I couldn’t see them, thus causing me to cut most of them to shreds with the lawnmower, we would have enjoyed more squash than we did. At any rate, the seed catalog was right: as delicious as ‘Waltham Butternut’ is, ‘Burpee’s Butterbush’ is better. Peppers: once again the hot pepper variety proved to withstand the disease that attacked the sweet pepper plants, thus only the hot pepper plants made a respectable yield. Tomatoes: had most of the tomato plants not died early from disease, yields may have set new records. But the excess soil moisture level seemed to reduce the taste of all the tomatoes even as it bulked them up. ‘Pink Berkeley Tie-Dye’ tasted good, different from ‘Arkansas Traveler’, but we thought it wasn’t up to the superlatives heaped on it in the seed catalogs. However, it might taste much better in a drier summer since it was developed in California. Beans: to keep the rabbits from eating the seedlings, I chose to plant pole beans and vining cowpeas among the corn plants, which were growing in the remaining fenced area. I didn’t expect a high yield due to competition from corn and both varieties met that expectation. I also found them hard to pick as they got above my head, and they made it harder to harvest the corn. But at least we got something to eat from these, unlike the snow and shell peas. Blackeyed peas: I planted them in an unfenced bed and protected the bed with repellent when the seedlings were small. 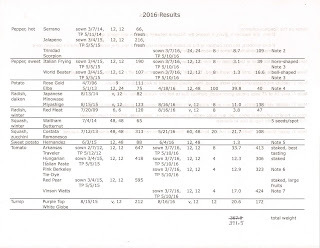 Whether it was due to the repellant or to rabbits not favoring blackeyed pea plants if they can get something better (and they could), we got a respectable yield. Dent corn: because I planted this into the fenced-off area, I don’t know if corn plants are on rabbits’ menus. But the corn ears have been on some critters’ menus in past years. This year, however, either the critters were gone, or their attention was elsewhere, or they just don’t like ‘Blue Clarage’ corn and so I got enough corn to be worth the time and space it required. Potatoes: remember I mentioned the lack of rain in mid-April? This was right after I planted the seed potatoes. Apparently my attention was elsewhere, probably on the rabbits, thus I neglected to keep the bed moist enough. Close to half of the seed potatoes failed to sprout. Memo to me: don’t forget to water the seed potatoes if the weather turns dry!